Thomas Parker of Uttoxeter: Notes on a Possible Scandal? From 1815 the law forbade officers of the Poor Law from profiting from their civic positions by awarding contracts to themselves for the supply of goods and services. 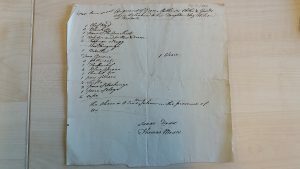 Thomas Parker was master of Uttoxeter workhouse in the early 1830s, but the poor law vouchers show that he was also charging the parish for goods supplied to the workhouse from his grocery business. In themselves the majority of goods are typical of those supplied by other grocers, but one item caught our attention: copperas (ferrous sulphate). This was a favourite ingredient used to ‘revive’ used tea leaves by boiling the leaves with the copperas. This set me thinking about other ingredients that were used to adulterate food and drink. Many such as cocculus indicus (an extract of the South East Asian fish berry containing a poisonous picro-toxin related to curare), opium, and oil of vitriol (dilute sulphuric acid) were illegal and harmful. Others including liquorice, treacle, pepper and ginger were often used to add flavour to beer. Although not harmful, they were cheaper substitutes for ingredients such as malt and hops. Uttoxeter workhouse produced beer, bought malt, hops, and barm to brew (fermented froth produced during the malting process); there are frequent purchases of liquorice, treacle, pepper and ginger. Were the workhouse masters using such ingredients in a fraudulent capacity?